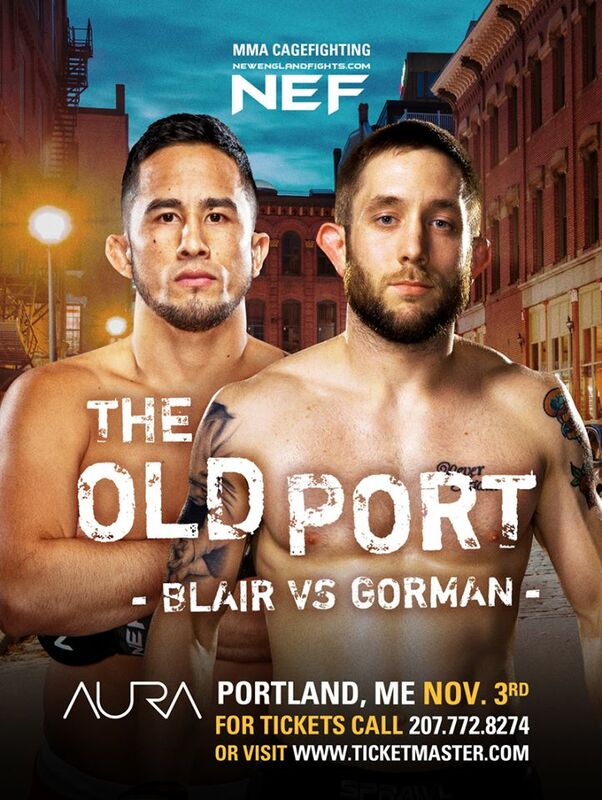 FOR IMMEDIATE RELEASE: Portland, Maine (October 6, 2017) – New England Fights (NEF) will make its long-awaited debut in Portland on Friday, November 3, 2017 at Aura with “NEF 31: The Old Port.” Earlier today, the fight promotion announced the full fight card for the event featuring a full slate of professional and amateur mixed-martial-arts bouts. Maine fan-favorite Paul Gorman (10-9) is scheduled to take on James “The Flyin’ Hawaiian” Blair (5-1) in the main event of the evening. Gorman, the former NEF bantamweight titleholder and a Brazilian Jiu-Jitsu black belt out of the Academy in Portland, makes his return to the NEF cage after a three-year absence. Blair is a hot prospect from the world-renowned American Top Team in Coconut Creek, Florida where he trains alongside a veritable murderers’ row of current and former world champions like Mike Brown (26-9), Tyron Woodley (18-3-1), and Joanna Jędrzejczyk (14-0) just to name a few. Reigning NEF Professional Middleweight Champion CJ Ewer (3-0) will be in action when he takes on Crowsneck Boutin (2-3) in a non-title affair. Ewer captured the 185-pound title over the summer when he submitted Mike Hansen (5-6) at “NEF 30: Rumble in Bangor.” Boutin will be coming off a year-long layoff from competition. “The Blackpool Ripper” Matt Probin (0-0) makes his pro MMA debut against rugged veteran Josh Parker (6-9). Both Probin and Parker have extensive backgrounds as professional boxers. Probin has trained and competed in Muay Thai in Thailand. Parker is the founder of Ruthless MMA & Boxing of Waterville, Maine. John “First Class” Raio (2-8) will come out of retirement to face Zenon “K-Bar” Herrera (0-5). Raio last fought in the summer of 2015. He is the head coach of First Class MMA based in Brunswick, Maine. Herrera, a veteran of both the United States Army and Marine Corps, is looking for his first win since joining the professional ranks two years ago. The amateur side of the card will feature a total of three title fights. NEF Amateur Heavyweight Champion Nick “The Guardian” Gulliver (4-0) will defend his strap against WWE signee Terrance Jean-Jacques (2-0), while Nate Boucher (2-0) and Justin Witham (3-4) square off for the vacant flyweight title. Alex Walker (4-1) and Hilarie Rose (4-3) will make history when they battle for the first-ever NEF women’s championship in the strawweight division. The Walker-Rose fight will be one of four female bouts featured on the “NEF 31” amateur card. Carol Linn Powell (0-0), wife of former NEF Professional Lightweight Champion and current UFC competitor Devin Powell (8-3), is scheduled to make her cage debut against Francesca Morabito (0-0). Jayda “Lil Killah” Bailey (0-0) makes her debut just eight days after her 18th birthday, the legal minimum age for competing in MMA in Maine, in a bantamweight bout with Danae Dostie (0-0) while Sarah Matulis (0-0) and Chelsea Elizabeth (0-0) face off in yet another double amateur debut.